These little kitties prove that amazing things come in small packages. Elfie and Gimli are two siblings who were brought a shelter in British Columbia, Canada, with their mom when they were just kittens. 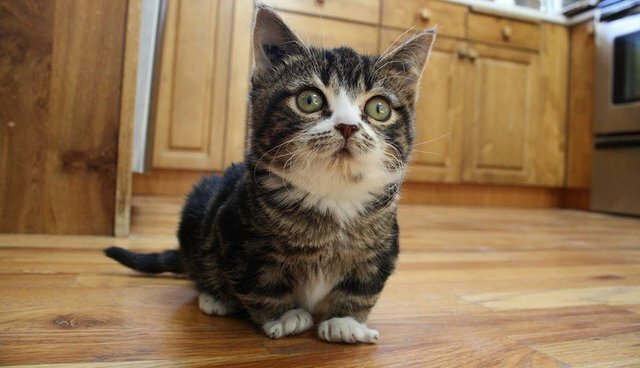 While their mom was a healthy, average-sized cat, shelter staff quickly realized that Elfie and Gimli had dwarfism. Elfie & Gimli on Instagram: "Where are MY chocolate eggs?? ð³ We hope you are all enjoying your Easter weekend! ð£ð #Elfie #ElfieTheDwarf #AdoptDontShop #CatsOfInstagram..."
"Luckily for Elfie and Gimli they ended up in a shelter where staff members were familiar with dwarfism in cats," their mom wrote on their Facebook page. Gimli and Elfie's adoptive mom was actually the one who processed their intake in the shelter - she fell in "love at first sight" and agreed to be their foster mom ... and a month later she adopted them for good. Elfie & Gimli on Instagram: "#throwbackthursday to when Elfie and Gimli started having full run of the house! They had their own room for quite a few months as they..."
According to their Facebook page, now Elfie and Gimli "live happily with two dogs, two cats, and their loving mom & dad." Their dwarfism doesn't keep them from normal cat activities like playing, napping around the house and being totally weird and adorable. Elfie & Gimli on Instagram: "*insert tuna in mouth* ð¯ Thank you everyone for the birthday wishes, I had a pretty amazing day! ð #ElfieandGimli #dwarfcat #dwarfism..."
Now Gimli and Elfie's mom and dog use their quirky looks and large following on social media to promote adoption, tagging their posts with #AdoptDontShop and encouraging followers to rescue animals from their local shelters. After all, without the shelter that saved them, who knows what would have happened to Elfie and Gimli? Elfie & Gimli on Instagram: "These two have a serious case of the Mondays. ð #elfie #gimli #dwarfcats #dontshopadopt #catsofinstagram"
But their family is quick to point out to their followers that Elfie and Gimli were not bred to be small, and they don't want to support "munchkin cats," a so-called "designer breed" of tiny cat. Elfie & Gimli on Instagram: "#flashbackfriday to this little short stuff! ð #Elfie #dontshopadopt #catsofinstagram #catoftheday #yyc #dwarfism"
Elfie and Gimli's family is prepared for the possible health challenges that may accompany their dwarfism, but they write, "they are healthy now and extremely loved by everyone who meets them." And they have a lot of fans who've never met them too ... the two kitties boast over 100,000 followers on Instagram. Elfie & Gimli on Instagram: "Let's never move again, okay mom? ðð #ExhaustedElf #PoorElf #AdoptDontShop #CatsOfInstagram #okanagan #Dwarfism #Dwarfcat"
So far, Elfie and Gimli haven't let the fame go to their heads. You can see more of them here.